I'm thrilled to finally get to share the cover and description of A Strange Hymn (The Bargainer #2) with you! For those of you who don't know about this series, it's a new adult paranormal romance trilogy that stars a siren and a fae king. You can check out the first book, Rhapsodic, here. 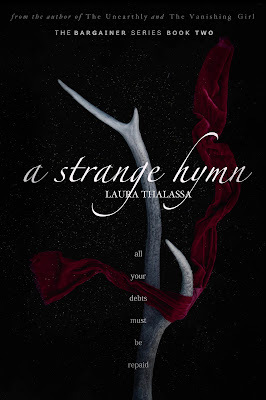 A Strange Hymn picks up where Rhapsodic leaves off, and in this book there's more romance, more mystery, and more Otherworld to contend with. I've been having an absolute blast writing it, and I hope this little glimpse into what's coming next whets your appetite! Oh, and FYI, I will be sharing teasers in the coming weeks and months, so check back in every so often! I haven't set a release date for A Strange Hymn, though I can say with relative certainty that it will come out by the end of May 2017. I will make A Strange Hymn available for pre-order (roughly a month or so before the release date). Sorry to keep you all in suspense! For those of you who are excited about my other unfinished series, don't fret! I have plans in the near future to finish both The Vanishing Girl and The Infernari series! Now that I've gotten all of that out of the way, are you ready to see the cover and read the description? Good, me too! Siren and soulmate to the King of Night, Callypso Lillis survived the clutches of Karnon, the mad king, and his twisted prison. But the nightmare isn’t over. Callie wears the physical reminders of her time as a captive, and mounting evidence suggests the Thief of Souls is still out there. When a fae celebration thrusts Callie and her mate, Desmond Flynn, into the Kingdom of Flora, they take their investigation with them. But under the bright lights and striking blooms of the realm, they find there are more immediate issues to deal with. No place is more uniquely savage than the great fae halls, and no amount of bargains can save Callie from royal intrigues. Fairies play dangerous games. Some want love, some want vengeance, some want flesh, and some want things too unspeakable to utter. One thing is for sure: no one is who they appear to be. Not even Des, who only grows more enigmatic with every passing secret. But the Kingdom of Flora has its own secrets, from bleeding trees to branded slaves and missing guards. Something is stirring in the land of all that grows, and if Callie isn’t careful, it will claim everything and everyone she loves—and her along with it.